The removal side of the business is run by Mr Graham Purdy. Initially Graham will visit you for the purpose of putting a quote together. Purdy's feel that the initial meeting is not just a matter of fact thing to find out how much the move will cost, but an opportunity to meet the man who will be taking complete responsibilty of your worldly goods. Graham is there to answer all the questions that you may have, and he usually manages to re-assure the client and ease some of the obvious stress which goes with a house move. After the meeting, Graham will prepare the quotation; taking into account vehicle size requirement and how much manpower is needed. Once the sums are done, Graham will either e-mail or post to you the finalised quotation, laying down a detailed plan of how the move will take place. If he feels that the move should be done over two days, he will advise this. Once you have acknowledged receipt of your quotation, you will never again be bothered by Purdy's. If you do decide to instruct Purdy's to take care of the move for you, simply drop us an e-mail or call us. Once you get the nod that you have exchanged contracts on your new home, just get in touch and at that point we can make the booking concrete. 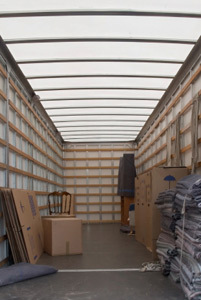 For moves within a 150 mile radius, we usually arrive at 08.00hrs on the day of completion. Anything outside of that range would usually mean loading up the day before,although the size of move does play a part in this decision.An average family home,a 3/4 bedroom house,usually takes around 4 hours to load. However this is extremely reliant on the house being properly packed. Once loaded we set off for your new home! Hopefully there is not too long to wait for the keys, but sometimes there is a delay. This goes with the territory and we simply wait until we can gain access. We then offload before returning home. If you would like to receive a free no-obligation quotation on your house move, please contact us today.